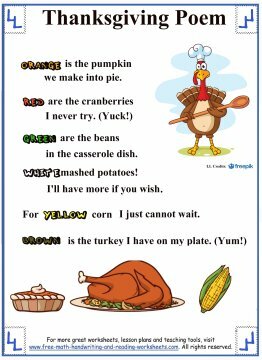 Here are a few Thanksgiving poems that we've created. 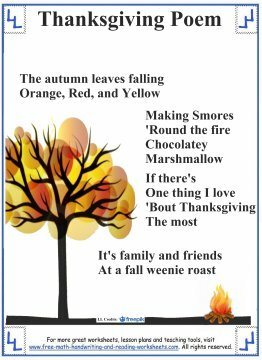 Our family loves coming up with silly rhymes, even Grandpa got involved and wrote a couple of the poems below. These would be great for handing out to your class the day before Thanksgiving break. You might also be interested in using them as part of a Thanksgiving show. 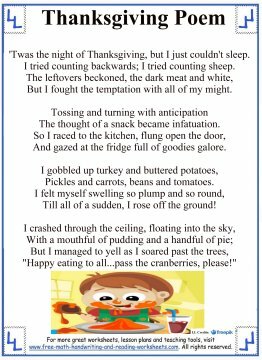 My wife and I have been to many Preschool concerts/shows where the kids sing songs or recite (usually at the top of their lungs) poems. The "poetry" below would be an excellent choice for any Pre-K concert. 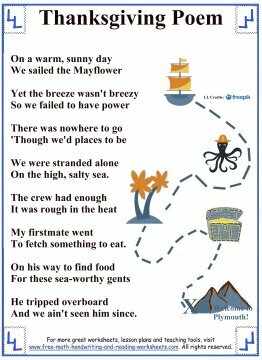 We tried to make poems that kids would find somewhat silly and that might give them an opportunity to yell during a recital. The third poem is an excellent example of this--yell out Yuck and Yum. 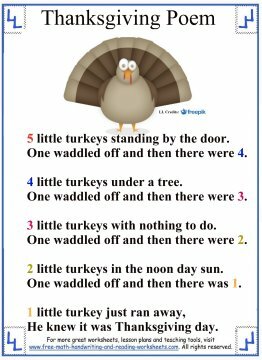 It's a variation on a song that we've heard many times at our children's Thanksgiving concerts. Beside being a fun thing for your students to do, the poems also teach simple counting skills and color recognition. 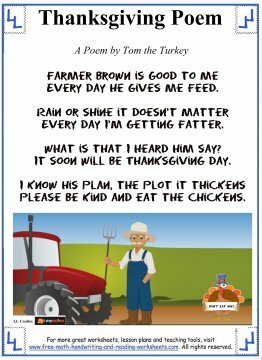 The poems you find here are all originals submitted by friends and family with the exception of The Night Of Thanksgiving which is an anonymous poem submitted by a site visitor and Five Little Turkeys which was tweaked and based off of three or four different variations found online. Again, I'm not sure who wrote it. 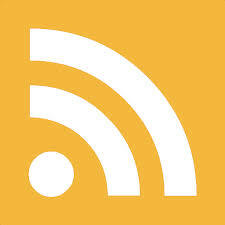 If you would like to submit a poem you can do so using the Contact link at the bottom of the site. 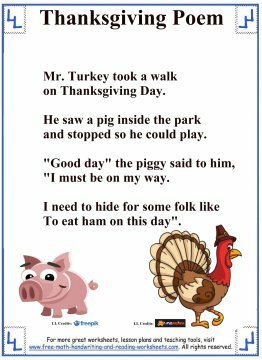 For more Thanksgiving activities and crafts, see the pages below.